Star Kusudama or Buzzy Snoobe! When I surfed the net, I used to read the same issues in several place. However, you've made a different point of view today. I really appreciate it. Your masterpiece is so amazing! Your moduler object made from paper is so elegant and beautiful. How do you think of my Origami Butterfly? Could you give me some advice? Its amazing. I can t believe we can make such art master pieces from papers. No doubt origami is the old art but it is not forgotten by the people and many people are doing it with expertise. There is no other option like essay service for the good and skilled assignment. Wow you always make such incredible designs with paper which sometimes seems to be impossible. I have been a huge fan of your origami, though i was busy with my editing in http://www.myessay.biz/editing/. I never miss to visit here and gaze at these models. This will be a whole new experience for you all, but it is sure to make you think a bit differently which is going to have a good effect on the things that you do from now also even without you knowing of it. no offense, but its a sonobe, not snoobe. it looks great though! 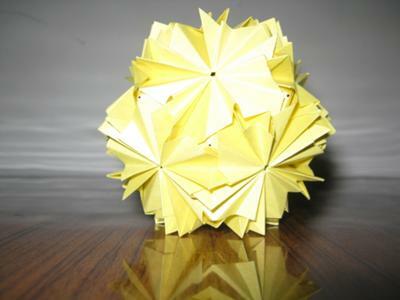 this is such a great piece of origami do u think u could make some instructions on how to make it? Hi there mousa! Im so impressed by this, it is fantastic!! Have you made any other modulars?